Plant skips a line during the final verse of Rock and Roll and ends up ahead of the band for a few bars before getting himself back on track. Page shreds through the guitar solo during Black Dog. Since I've Been Loving You features an aggressive guitar solo from Page. The Song Remains the Same is played at a frenzied pace. Bonzo attacks his drums with incredible force during the initial verses of Dazed and Confused. The lead-in to the bow solo features an excellent call and response between Plant and the rest of the band, followed by one of the best renditions of San Francisco thus far. Page's fingers fly across the fretboard at lightning speed during the amazing guitar solo/workout section. A truly epic performance. Plant's voice is incredibly powerful during Stairway to Heaven. Whole Lotta Love is preceded by a fantastic intro reminiscent of The Who. The Everybody Needs Somebody to Love section begins with a cacophonous explosion. The medley includes Boogie Chillen', Elvis Presley favorites (You're So Square) Baby I Don't Care and Let's Have a Party, I Can't Quit You Baby, and Goin' Down Slow. Unfortunately, the tape suffers from major disturbances for the remainder of the show beginning during the blues improvisation. Page blazes through the solos during Heartbreaker. Bonzo pummels his drums during the final verse. The band closes the show with what will prove to be the final recorded performance of What is and What Should Never Be. Plant ends the night in good form, regaining some of his former glory. He leaves the crowd with a simple "thank you very much... see ya." The tape is a bit hissy, distant, and lacking bottom end. Unfortunately, the quality deteriorates drastically toward the end of the show. Great Blog. Have been following with interest. Thanks for sharing and well done for persevering so far. One question about this date: The A15 recording is often attributed to Rotterdam, 11th March 73. Is it definitely Aberdeen? I have seen an Aberdeen bootleg that does not have WIAWSNB as the final song. Second, general consensus over at R-O is that the recording is from Aberdeen. And since there are folks over there who have done far more research into such matters than myself, I tend to believe their assessment. "Regarding "What Is And What Should Never Be" featured on the TDOLZ release not really being from this show...that is an interesting portion of tape for a variety of reasons. First off, on the version of the song featured on the TDOLZ release Bonham can specifically be heard playing his tympanis at the end of the song. This is important to note because Bonham didn't have the tympanis onstage prior to Japan in October of 1972 (presumably purchased so as to be able to play "The Song Remains The Same" live). Photos from the US tour of 72 confirm that he previously had just the green sparkle kit onstage. Yet, on the "Aberdeen" tape, he can be heard playing those tympanis. And since we have no record of the band playing that song at any point during the subsequent tours from 1973-1980, it makes placing the date even more bizarre. Additionally, the song is definitely from the end of the night, as proven by Plant's farewell comments after the song ends. Yet, in the band's regular live performance of the song from 1969-1972, they never once played it as the final song in the set. So, not only is the version heard on the TDOLZ release a rarity for supposedly having occured in 1973, but it's also a rarity for having been played as an encore. As for the sound of the band, Plant's vocals definitely sound similar to his post-Sheffield '73 state, during which the Aberdeen show occurred. So, we can further remove the possibility of the song being from an earlier tour. And, given that Plant's performance at the Aberdeen show was very good for the era, his performance of the song on the TDOLZ release does sound like one might imagine the song would've, had it been performed during that period in early 73. As for the tape itself, the sound quality of the song doesn't match with any of the other tapes from the 72-73 UK/Euro tour, so it doesn't immediately appear to be taken from some other show we already have. And, even though the "What Is..." portion of tape on the TDOLZ release does sound slightly different from the rest of the Aberdeen recording, that could still be reasonably explained. For instance, the difference in sound could be due to a defect in the actual tape used for the TDOLZ release, or even inherent to the master. There is a noticeable drop in quality halfway through the "Whole Lotta Love" medley, as if the tape had become worn-out or garbled. This dulled sound remains through "Heartbreaker", and then the tape is cut and starts up again with the beginning of "What Is And What Should Never Be". Other possibilities include the taper having moved his seat after "Heartbreaker", having assumed that the show was over. So, when the band came back onstage, he began taping again from his new spot, thereby accounting for the difference in sound. This wouldn't be the first tape to have an encore sound different from the rest of the show. Take Fort Worth 8/23/71 for instance, where this exact scenario also happened. And then there is the possibility of a second source tape. 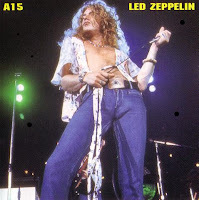 TDOLZ’s release of the 4/1/73 Paris show made use of not just one, but two separate sources for the same show, neither of which circulate in complete form or were ever released by any other boot label. Could the portion of tape used for "What Is and What Should Never Be" be from a separate source of the Aberdeen show that has yet to circulate? I don’t know. A lot of speculation involved, sure. But, ultimately, if the version of "What Is And What Should Never Be" is not from Aberdeen, then where could it be from?" Everything mentioned above makes sense. So, being as there's no definitive answer, I'll keep WIAWSNB attached to this show until some new info (or a new tape) comes to light. Thanks for the clear illumination. You're right that there are some well-researched folks out there. I await with interest to see if June brings a Rotterdam recording. Best wishes for the completion of your monster project and thanks again.